Edgar Lungu has quietly removed army officers from Lusaka streets for fear of unintended, unknown consequences. He does not trust the army. According to people close to the operation, only ZAF officers have remained on the streets. Intelligence reports indicate that army offices were separated and removed from the street just after two weeks of the operation. Lungu deployed soldiers to enforce a curfew that was imposed during the cholera outbreak last December. 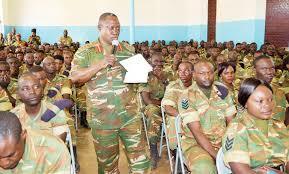 Intelligence reports say Lungu does not trust the Zambian army and has thus ordered them to return to the bases but has kept Zaf officers led by his fellow kleptomaniac Eric Chimese. While the Zambian army has remained a professional defence force , Chimese and Lungu are turning ZAF into a PF security wing.